​Riverfront Residences is on a site previously named Rio Casa. It was sold collectively through en-bloc for $515 million. The site has a 200m frontage from the river which allows a tranquil scenery. 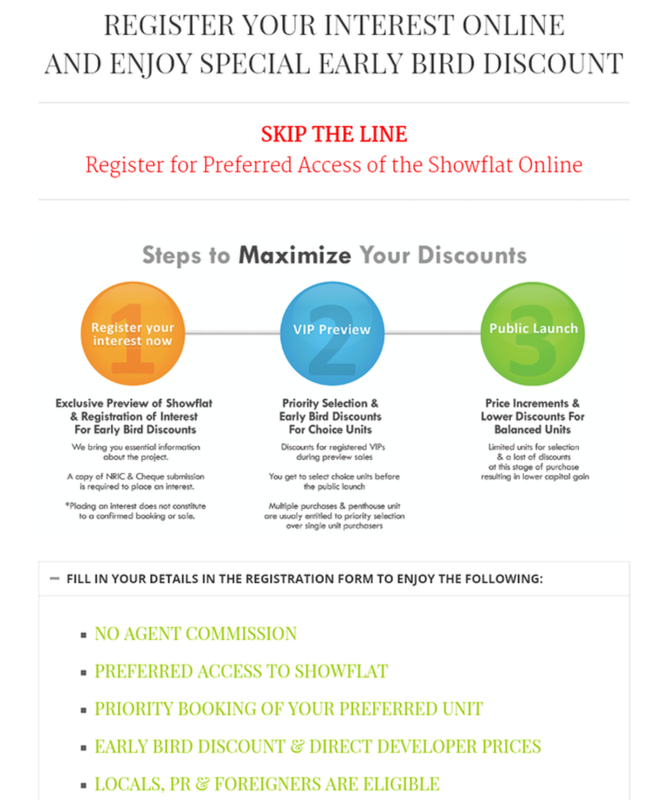 Riverfront Residences is a new upcoming launch nested in Hougang Avenue 7. It is a joint venture by Oxley Holdings, Lian Beng Group, KSH Holdings and Apricot Capital. 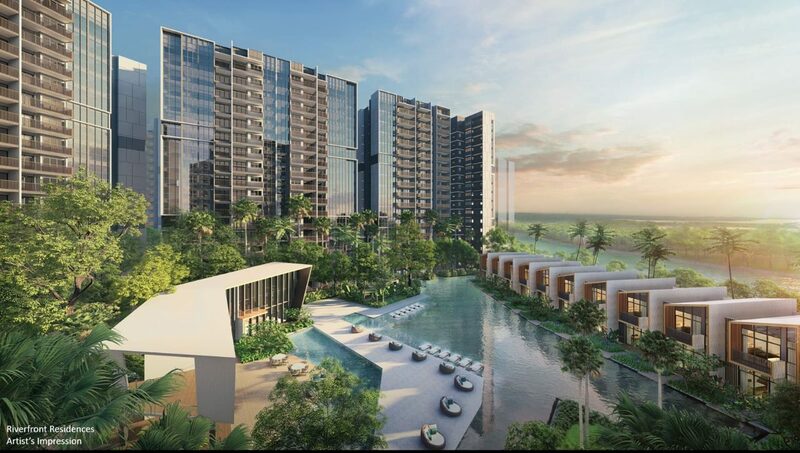 The estate has a land area of 36,811 sqm with a gross plot ratio of 2.8, the Oxley consortium plans to obtain a fresh 99-year lease for the property and redevelop it into private residential blocks and villas with approximately 1,472 units being planned to cater to mass market demand. 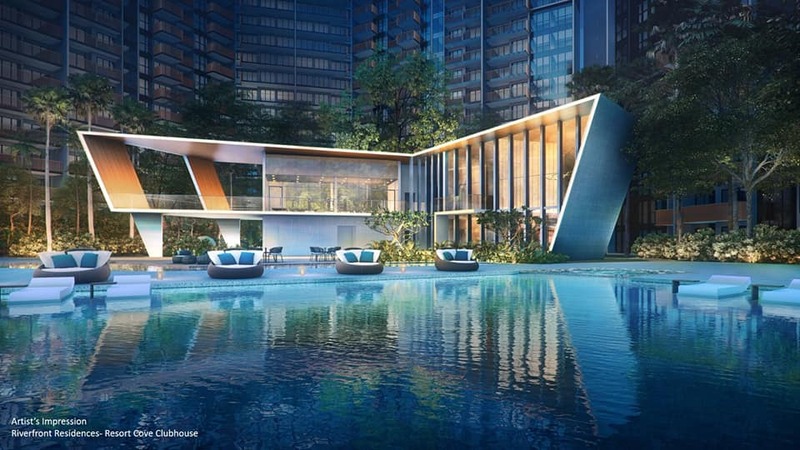 Riverfront Residence is a residential condominium, developed jointly by Oxley-Lian Beng Venture Pte Ltd and Joint Venture Partners - KSH Development, Oxley Holdings, Lian Beng Group and Apricot Capital. Closely located to Riverfront Residences Condo is also the Hougang Mall, a popular shopping mall located near to Kingsford Condo. It is close to the Hougang Central Bus Interchange. The Hougang Mall is also host to some important anchor tenants like the National Library Board, KFC, and McDonald’s. Riverfront Residences also has a panoramic view of the river, that offers a majestic and beautiful environment and a pleasing scenery to wake up to, every morning. 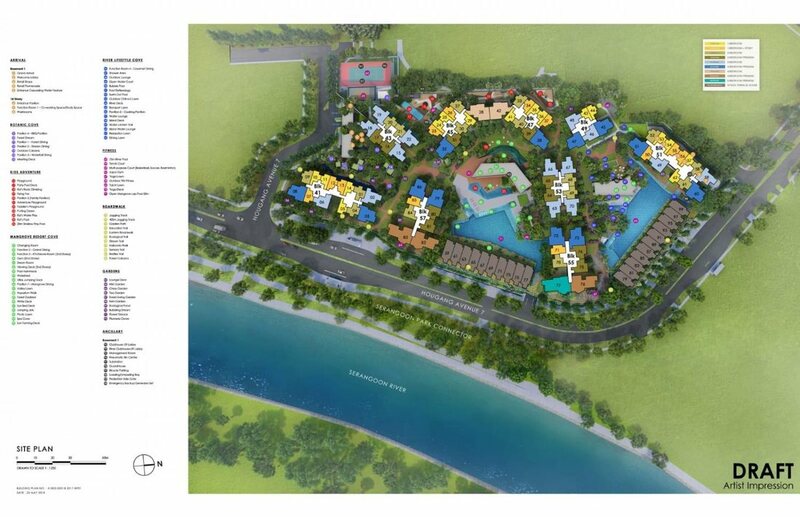 Riverfront Residence will be optimally connected by various transportation modes. There will be Hougang Bus Interchange nearby as will be several MRT stations like Hougang, Buangkok and Kovan MRT. The residents will be able to travel to any other part of the city and its suburbs including Dhoby Ghaut and China Town as all these MRT stations are connected by the North East Line. Riverfront Residences total area covered by the project is 396,234 sq ft and a maximum permissible Gross Floor Area covered is 1.1 million sq ft. 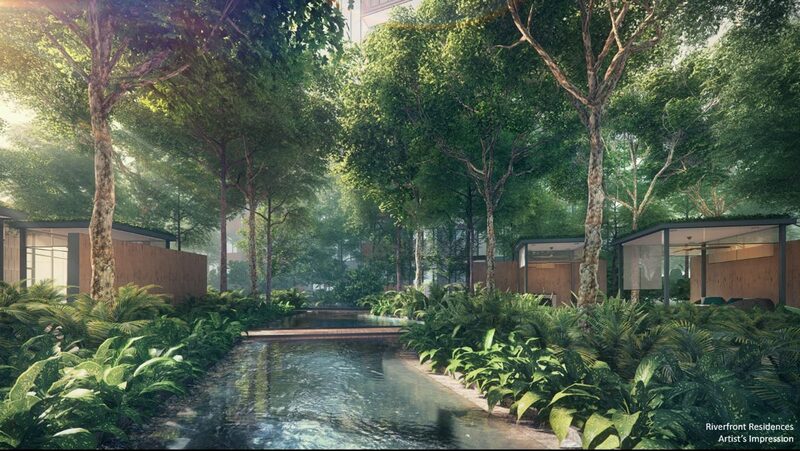 The expected date of legal completion is 2025 with a leasehold tenure of 99 years and it was previously En-bloc of Rio Casa, which was private HUDC estate. Nearby primary schools include CHIJ Our Lady Of The Nativity, Holy Innocents’ Primary School, and Punggol Primary School. Strategically located along Hougang Avenue 7, District 19, Singapore, Riverfront Residences has a site area of 396,234 sq ft, and comprises 1,400 one to five bedroom units. 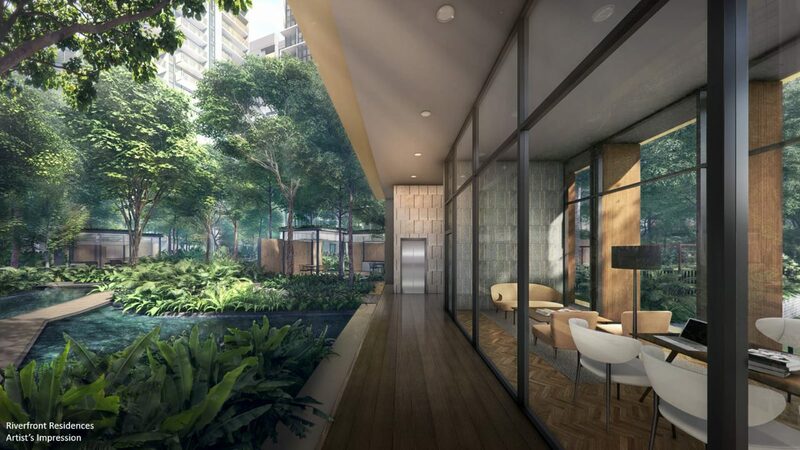 The 99-year leasehold Riverfront Residences features one- to five-bedroom units that range from 463 sq ft to 1,905 sq ft as well as four-bedroom strata terrace houses measuring 2,109 sq ft. Prices start from $578,000 for the one-bedders to $1.97 million for the five-bedders, while the strata terraces are going for $2.35 million each. Set to be completed by 2024, this 1,472-unit residential project in Hougang has a large land area of about 396,231 sq ft – enabling its developers to integrate over 100 facilities. These include three clubhouses that come with different amenities like a gym and KTV/movie room, co-working and study space, and a fully-equipped kitchen. There will also be a dockless bike sharing system for residents.